Michael Bloomberg and Hillary Clinton in 2002. That Michael Bloomberg won’t be running for president can’t be considered a huge surprise. The former New York mayor was previously rumored to be seeking the White House in 2006, 2007, 2008, 2010, 2011, 2012, 2013, 2014 and 2015, according to news reports compiled by The Atlantic’s David Graham, but failed to enter each time. Bloomberg’s decision, announced on Monday afternoon, is still a reasonably big deal, however, because as Bloomberg himself concluded, his candidacy could potentially have thrown the election to Donald Trump. There are various ways to get at this conclusion. While there hasn’t been a ton of public polling testing Bloomberg’s candidacy, most of it showed Bloomberg taking more votes from Hillary Clinton than from Trump in a potential three-way race. Ideologically, Bloomberg wouldn’t have all that much space to himself. Bloomberg’s policies are more center-left than truly centrist, making it hard for him to differentiate himself from Hillary Clinton. And Trump already in many ways resembles an independent candidate. Bernie Sanders, if he were the nominee, might have provided Bloomberg with slightly more running room. But after Super Tuesday, with Sanders running well behind the delegate pace he needs to win the Democratic race, Clinton now looks like the much more likely Democratic nominee — perhaps a factor in Bloomberg’s decision. It’s also hard to see how the demographics would work for Bloomberg. As it happens, I’ve been working on a model of a potential third-party candidacy. Because we’re writing this story on short notice, I’m going to be more circumspect than usual about describing it. But the basic conclusion is that it’s incredibly hard to find many votes for a center-left third-party candidate without eating substantially into the Democratic coalition. African-Americans (12 percent of voting population): extremely Democratic-leaning. Hispanic, Asian, “other” and mixed races (14 percent): Also strongly Democratic leaning, especially in recent elections. White evangelicals (23 percent): Strongly Republican. White cosmopolitans (20 percent): These are white, non-evangelical voters who favor both gay marriage and a pathway to citizenship for immigrants who entered the country illegally. They’re a highly Democratic-leaning group, mostly concentrated in urban areas and college towns. White “picket fence” voters (15 percent): These are whites who are neither evangelicals nor cosmopolitans, but have high socioeconomic status as indicated by income, education levels, home ownership and other factors. This is a largely suburban, center-right group who went for Mitt Romney over Barack Obama about 2 to 1 in the previous election. White working-class voters (16 percent): Whites who are neither evangelicals nor cosmopolitans, and have lower socioeconomic status. Once a good group for Democrats, they now vote Republican about 2 to 1. In this scenario, Bloomberg wins about half of white cosmopolitans, along with about two-thirds of white “picket fence” voters. But he doesn’t make much inroads with the other groups, especially white evangelicals and working-class voters, who mostly go with Trump. Bloomberg takes a few black and Hispanic votes away from Clinton, but not many. 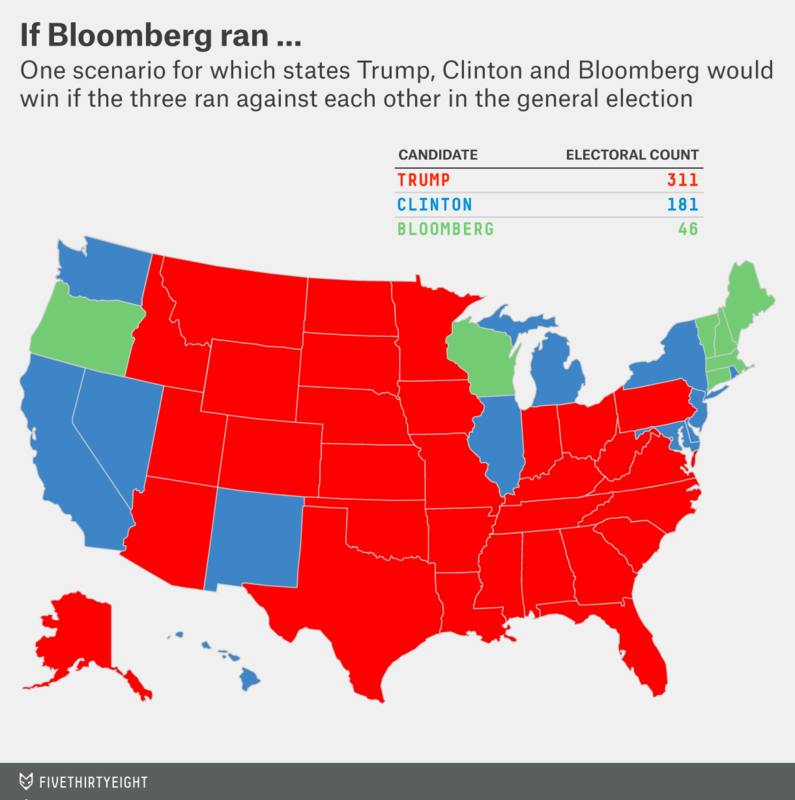 This would produce a fairly close popular-vote outcome: Trump 35.5 percent, Clinton 34.7 percent, Bloomberg 29.8 percent. (To repeat, I think this is probably very optimistic for Bloomberg.) But he’d deprive Clinton of some of the white swing voters she’d need to win the Electoral College. In fact, according to our model, this scenario would result in a fairly lopsided Electoral College win for Trump, with Trump getting 311 electoral votes to 181 for Clinton and 46 for Bloomberg, whose wins would be restricted to a handful of predominantly white states like New Hampshire with a high number of moderate and independent voters. Clinton holds up well in states in states such as New Mexico, where Democrats rely on a substantial minority turnout. But she’d be vulnerable in predominantly white states, which would mostly go to Trump (Iowa, Ohio, Minnesota) or in some cases to Bloomberg (Wisconsin, New Hampshire). As I’ve said, these scenarios are hypothetical. But I’d encourage you to play around with the numbers yourself and see if you can get a Bloomberg-like third-party candidate within range of an Electoral College victory. More likely, a candidate who appealed to wealthy, secular, cosmopolitan white voters, but not religious whites or working-class whites, and who still ceded most minority voters to Democrats, would have a heck of a time building a plurality (much less a majority) coalition. Essentially, such a candidate would be splitting the Democratic base, while only picking up a few voters who ordinarily vote Republican. That would be bad news for Clinton, bad news for Bloomberg — and great news for Trump. And despite fanciful maps put forward by Bloomberg’s advisors that had him competing in Tennessee and Texas, Bloomberg saw the writing on the wall and decided not to run.